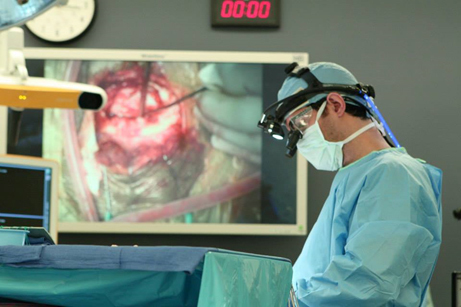 The UCLA Neurosurgery Residency Program provides comprehensive, state-of-the-art clinical training in all major subspecialties of neurosurgery. The rigorous core curriculum is designed to achieve educational, clinical, and technical excellence. UCLA's clinical environment provides residents with a broad range of experience by virtue of the extensive population of patients served, the multiple facilities through which residents rotate, and the broad scope of faculty expertise. The Ronald Reagan UCLA Medical Center, which is in Westwood and on the main UCLA campus, is a tertiary referral center for a large geographical area in Southern California and regularly receives patients from around the United States and foreign countries. Residents obtain their core clinical training rotations rotating through five major metropolitan hospitals. Each hospital provides a unique, but complementary, training environment that allows trainees to the full gamut of neurosurgery practice. Whereas the core curriculum provides an extraordinary sound foundation of clinical practice, the residency program has built in flexibility that allows for residents to customize their training curriculum to meet their individual needs. The 7th year of training is an ‘Elective Year,’ allowing each resident to design their individual curriculum to foster their professional development: accommodating focused clinical subspecialty electives or an enfolded clinical fellowship. 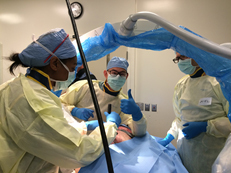 In addition to providing robust clinical training, our goal is to produce the next generation of leaders who, through innovation in basic science and/or clinical research, will advance the field of neurosurgery. The residency curriculum is geared to prepare our graduates for academic success. One year of training is dedicated to research. This research experience is just the foundation, with many of our residents expanding their research opportunities in subsequent years, including obtaining advanced degrees. 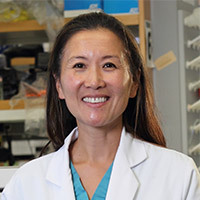 As one of the world's leading research universities, UCLA offers nearly unparalleled, diverse resident research opportunities, The academically productivity of the UCLA residency program is ranked second highest in the country among all neurosurgical programs (Taylor et al., J Neurosurg 123:547–560, 2015). UCLA neurosurgery residents enjoy the rich cultural experience and amenities of living in one of the great cities of the world. The UCLA Medical Center, clinics, and multitude of medical research buildings are situated directly on the UCLA campus in Westwood, CA. Only five miles from the beautiful Pacific Ocean, Westwood is fun college-based community. Residents can enjoy the same UCLA facilities as all other students, including the opportunity to watch Division 1 sports, amazing theater and arts productions, or go to the Wooden gym. The surrounding city of Los Angeles provides endless opportunities for great food and entertainment. Dr. Bergsneider is Professor and Residency Program Director. He has been a faculty member at UCLA since 1994. 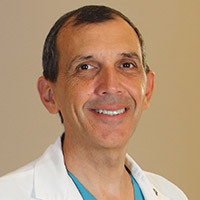 His primary clinical focus is endoscopic endonasal approaches to the anterior skullbase. Dr. Bergsneider is a recognized authority in the field of adult hydrocephalus and intracranial pressure physiology. He has been awarded numerous NIH research grants. He is dedicated to neurosurgery resident training and has won multiple teaching awards. The Accreditation Council for Graduate Medical Education (ACGME) is responsible for the Accreditation of post-MD medical training programs within the United States. Accreditation is accomplished through a peer review process and is based upon established standards and guidelines. 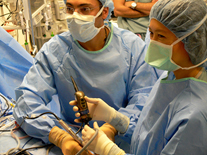 The UCLA Neurosurgery Residency Training Program is currently an ACGME accredited program. The seven year UCLA neurosurgery residency program has three residents per year.